Q: When did your interest in photography begin? A: Ever since I was a kid, my mother had a film camera that she always carried around and took pictures of everything so she always inspired me to get into photography. 5 years ago, I started taking random pictures on my phone of my surroundings; the street I live on, the mosque next to my home, etc. Then I worked on myself, developed my skills & now I’m 21 and found my signature style which is night street photography. Q: Where do you get most of your inspiration? A: My inspiration comes from Japan and its neon signs. It’s my ultimate dream to go to Tokyo. Low light photography & Street photography interest me the most. There’s something so mysterious about the streets at night and that really intrigues me. I’m also influenced greatly by street wear culture and it’s a big part of my aesthetic. Q: Your work deals a lot with the female experience. Why do you feel its important to portray this in your work? Do you feel that this portrayal is missing/lacking in the photography and art world? A: I feel that it’s very important to portray that in my work as I’m a firm believer in feminism. My message is to empower Egyptian women & letting them be themselves without society constraining them. Yes, I do feel that this portrayal is lacking in Egypt & everyone should pay more attention to this subject. Q: Please talk a little more about the shoot you did with an Egyptian pole dancer which was featured at the Berahet-ha exhibit recently? A: I’ve known my friend Maya for a while and I wanted to shoot her in a feminine & empowering way rather than a sexual way as many people view pole dancing. I also wanted to shed a light on it as it’s rather unfamiliar here in Egypt or the Middle East in general. This shoot is meant to show to the grace & power of the pole dancer. During the shoot there was a roller coaster of emotions in her studio from being passionate and having fun to being frustrated and in physical pain. The two neon colors Red & Blue reflect them perfectly. Believe me it’s not as easy as it looks. There were a lot of fails to get the perfect pose but she nailed it. It requires physical strength, flexibility, patience & practice. My friend has been practicing for a year now & she’s pretty good at it. A: Well for me when I plan a shoot, I like to think of new & edgy ideas. I shoot mostly in the streets as I feel it’s more authentic & raw. I use the street’s neon lights and signs as my lighting sources. Also, I feel like the connection between the model and the photographer is so important as it’s a bonus if the model knows and trusts the photographer as the outcome turns out real & raw. I use a DSLR and a lens with a small aperture so that I’m able to get good low light shots. Q: In what ways do you feel your work is significant in Egyptian society? 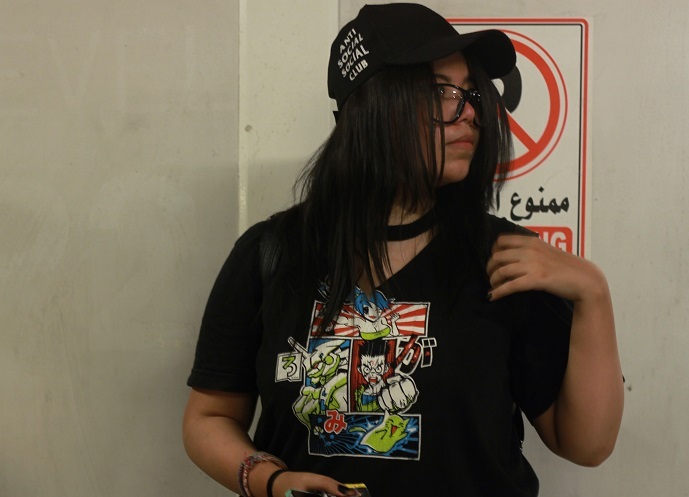 A: I feel that there aren’t many female street photographers in Egypt & that it’s my role to change that & hopefully inspire more females to go out and shoot as it should be normalized in our society. Q: What advice do you have for others (especially young women) interested in this same line of work? A: I’d say just go out & shoot! Don’t let anyone or anything stop you or tell you that you can’t do something. we all start somewhere. To me gear don’t really matter that much if you have a unique vision so you just have to find your style & trust your guts.